Five sadistic gunslingers are after a famous gunman with a $10,000 bounty on his head. Now an alcoholic and his whereabouts hidden by his girlfriend, Rosie, El Puro despises killing and in a poignant moment, proclaims his fear of dying. Eventually the five men catch up with him. Four desire only the money, but the leader, the psychotic Gypsy, wishes to have El Puro's reputation by meeting him in a duel to the death. This is an unusual Italian western and one of several somber, experimental genre pictures that falls somewhere between the operatic excesses of Baldi's The Forgotten Pistolero, 1969, and Julio Buchs' epic tragedy A Bullet For Sandoval, 1970. In America, the western had evolved into something more grim and visceral, a progression from where Leone had taken the genre some six years prior. Now, the Italians were responding with their own equally downbeat interpretations; a grim style Corbucci had already brutally embraced with his Great Silence, 1968. 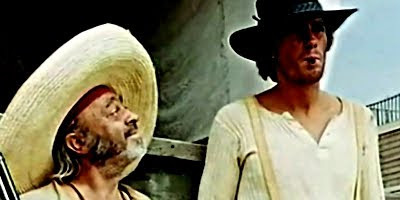 At any rate, El puro has more in common with Corbucci than Peckinpah. There's even an old witch character like the one seen in Castellari's existential oater Keoma, 1976. One of the best, if not the best of Mulargia's noticeably spotty resume of oaters, El puro is light on action, but long on substance. It deserves a better fate than to be buried beneath a few hundred of the lesser films this genre was spitting up around this time. One of Robert Woods best western roles, he brings to mind Gene Wilder as the drunken gunfighter in Brooks' Blazing Saddles of all things, but in a deadly serious vein. His struggle to rekindle his supreme gunfighting skills is intensified once his girlfriend is mercilessly killed by Gypsy. The actor playing Gypsy is terribly over the top, but efficiently conveys his homicidal tendencies and apparently has caused some critics to observe some perceived homoeroticism. The Alessandroni score is terribly derivative of Morricone, but is fine just the same. The editing is sloppy at times, but the English version seems to be missing around 11 minutes of footage. Regardless, El puro is an incredibly bleak, unsung gem well worth tracking down.